Looking for an unusual activity and an opportunity to purchase a unique work of art? Check out the 17th annual Virginia Hot Glass Festival on May 25-26 at Sunspots Studios in Staunton. This festival is Virginia’s only annual festival that exclusively features hot glass. Sunspots Studios, located in the historic 1929 Klotz building in Staunton’s Wharf District, has offered people the opportunity to browse a gallery of exquisite gifts and collectibles and watch live while artists blow and form hot glass into that art for 18 years. On one special weekend each year, enthusiasts are in for an extra special treat at The Virginia Hot Glass Festival. Visiting artists gather at Sunspots to show off their skills and wow the crowd as they create exquisite crystalline objects. Visitors can watch demonstrations all weekend, as well as view and shop for finished (and cooled) pieces. Booths fill the entire second floor of the Sunspots building. This work includes vases, jewelry, ornaments, glassware, paperweights, and beads. Make sure to visit when featured artist Grant Garmezy, sculpts – rather than blows – his notable life-like animals out of 2000-degree glass. Garmezy is one of a rare few glass artists in the world who approach glass art in this way. Featured on the cover of Glass Art magazine, Garmezy creates “high-end realistic glass sculpture with distinctly Southern imagery.” Garmezy, who lives in Richmond, has been sculpting in glass since 2003. He has demonstrated his art and technique all over the world. For a preview of Garmezy in action, check out YouTube for videos of him sculpting a dragon and a Siberian tiger. Barren Ridge Winery will be offering tastings, and additional activities can be found at nearby Sunspots Pavilion, including exhibits and demonstrations by the Virginia Stone Carvers. The Virginia Hot Glass Festival is free, located indoors, and handicapped accessible. Win your date’s heart over with a romantic dinner followed by one of Staunton’s sweetest treats. Make your special someone swoon with the help of a delicious dessert from this list. Why not relive your first date with a movie at the Visulite followed by a short stroll to The Split Banana for gelato? With 18 flavors ranging from classic to unusual tastes like mojito and almond fig, you’ll find something to make your tastebuds sing. Share a banana split and imagine your futures 5, 10, 15 years from now. Don’t lie – those futures will feature gelato! When you want a treat that’s as beautiful as it is tasty, don’t hesitate to wow your honey with one of the rich and decadent desserts at Paris Cake Company. Gorgeous cupcakes shaped like a bouquet of flowers? Check. Individual coconut cream pies? Chocolate chip cookie cheesecake? Check and check. Bonus: You can indulge in these treats after an equally delicious dinner at Table 44. Don’t wait until Valentine’s Day night to steal your sweetie’s heart. Meet for coffee and pastries at Réunion, a Staunton sweet spot which recently received a nod from Vogue! Enjoy espresso, buttery croissants, and a morning of gazing into each other’s eyes across a cafe. Staunton will be replacing Paris as the City of Love! It’s always time for pie! Firkin Pie Company bakes beautiful, flavorful pies in both the sweet and savory variety. The menu varies, but expect seasonal flavors like cranberry chess and chocolate silk. Even Cupid couldn’t keep his hands off this fine, fine pie! It will be love at first bite when you present your special someone with a box of handmade, gourmet chocolate from Cocoa Mill Chocolates. The Valentine’s Day assortment even comes in an attractive and edible box. Looking to spend an entire weekend with your special someone? 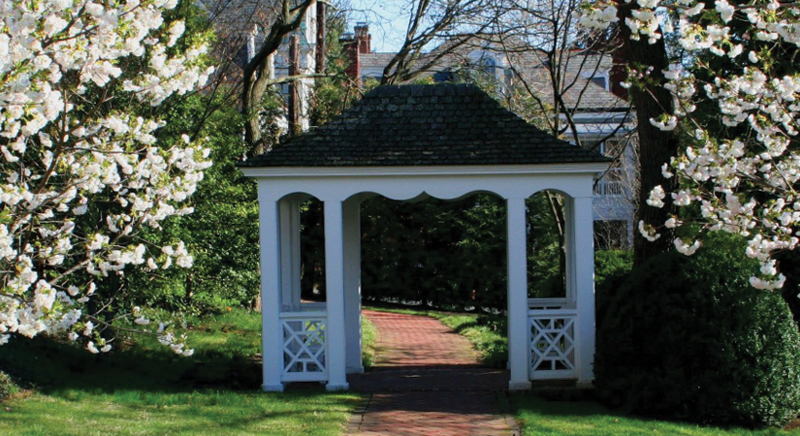 Check out 48 Hours of Romance in Staunton for a sample itinerary. Spring break is here and that means it’s time to kick the cabin fever and get outside with the kids. Now that the weather is warmer, Staunton is bursting with stuff to do. Visit for a day or spend a weekend. Here’s your guide. Does your family love trains? Visit the historic train station and Sears Hill Bridge. You’ll see the tracks – and Staunton – from above. On the other side of town, the Gypsy Express Mini-Train runs on the weekends from May to October in Gypsy Hill Park. For an awesome display of model train layouts and railroad art, head to the Augusta County Railroad Museum in the Staunton Mall. And if your obsession leans toward fire trucks, you’ll like the Staunton Fire Station, where you can see JUMBO, the oldest motorized fire engine in Virginia and the only remaining 1911 Robinson fire engine. Pack a picnic and rent a wagon for a day of exploration at the Frontier Culture Museum. You’ll learn about the Valley’s earliest settlers as you make your way from the Old World to the New. 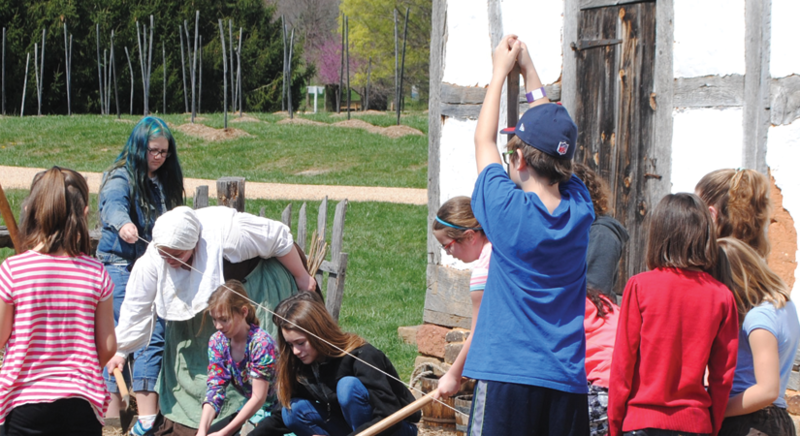 Costumed interpreters and farm animals bring the farmsteads to life. Older children might enjoy learning about the life and legacy of our 28th President at the Woodrow Wilson Presidential Museum. Montgomery Hall Park is one of Staunton’s best kept secrets with its rolling hills and quiet woodlands. The park includes 148 acres of nature hiking and mountain biking trails. Younger children just getting used to their wheels might prefer the mostly flat, 1.3-mile paved loop at Gypsy Hill Park. Staunton is only a stone’s throw from Shenandoah National Park and the George Washington and Jefferson National Forest which are filled with hikes and other outdoor recreation. Don’t miss a chance to enter the Bard’s world at the American Shakespeare Center’s Blackfriars Playhouse. See a play and be sure to schedule a tour so you can go behind, under, and even on stage! If you’re looking for films, visit the Visulite where Mom and Dad can sip a glass of wine or beer during the show. And for a real bargain, check out Legacy Theaters, where all tickets are only $3. Located in Montgomery Hall Park, Nature Ridge is designed for imaginative play. It features a tunnel, mud kitchen, elevated walkways, pirate ship, chimes, and sand pits.. Montgomery Hall park also has a traditional playground and a public pool for warmer weather. Gypsy Hill Park offers a large playground with structures designed for children ranging from 2-12. It also offers a tot lot for the youngest crowd. Pop in to play at Pufferbellies, the largest independently owned toy store in the Shenandoah Valley, and enjoy the carefully curated selection of toys, games, and books. Gaming fans will find all kinds of gaming and hobby supplies including dice, living card games, and hobby rocket kits at the Dragon’s Hoard. Video game enthusiasts can purchase games and consoles at Game Stop. And for beautiful dollhouses and the detailed miniatures to furnish them, try Ware House Miniatures. If you have an hour and a team of sleuths on your hands, take them to Crack the Code escape room and work together to solve puzzles and escape. Themes include The Dark Mage’s Rise, Haunted Mansion, and Steampunk City. Ages 10+. If you want to get more mileage under your belt, explore different parts of Staunton on foot using the free app, Traipse! Traipse provides an adventure that is half historic tour and half scavenger hunt. You can even build your own tour based on your interests, time and even level of difficulty. For a cool and unusual experience, check out the live glassblowing at Sunspots Studios. 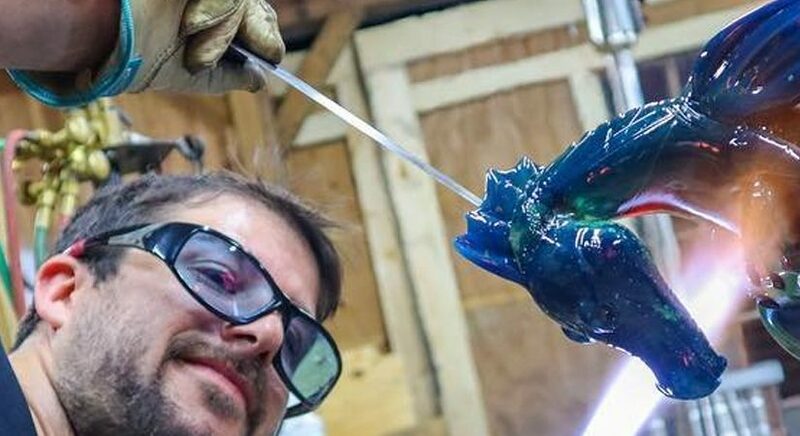 Artists blow bubbles from lumps of molten glass and turn it into ornaments, vases, and other beautiful pieces. Sunspots offers a chance to try your own hand at this (with the help of a trained artist) when you try “Blowing Your Own Ornament.” Enjoy the art gallery experience and support local artists at the Co-Art Gallery and the Artisans Loft. Visit the R.R. Smith Center for art and history. And if your kids like to build models, take them to Staunton Trains and Hobbies for model kits and supplies. Want to relax as someone else drives you around Staunton stopping at all the important attractions? Ride the green trolley for 25 cents per rider, per trip. The Green route runs every 30 minutes from the Visitors Center located at 35 S. New Street. Check out the Victorian architecture from your seat, or hop off to view the Woodrow Wilson Presidential Library & Museum and Gypsy Hill Park where the kids can feed the ducks. Order by the slice or by the entire pie from Shenandoah Pizza & Taphouse. Locally named, gourmet pizzas, feature a variety of ingredients including dill pickles for those who want to stretch their comfort zones. The Depot Grille is a good place to go for a kid-friendly experience with a big menu, and if you’re looking for old-fashioned burgers (and ice cream to follow) head to Wright’s Dairy Rite. Speaking of ice cream, other Staunton hot spots include Kline’s for custard-style ice cream and the The Split Banana for homemade gelato. Spring break over? Visit Staunton for festivals during the warmer months, including Earth Day, Art in the Park, and Happy Birthday America. For other special events and weekly happenings check out Staunton On Tap, our schedule of events with all the latest happenings. 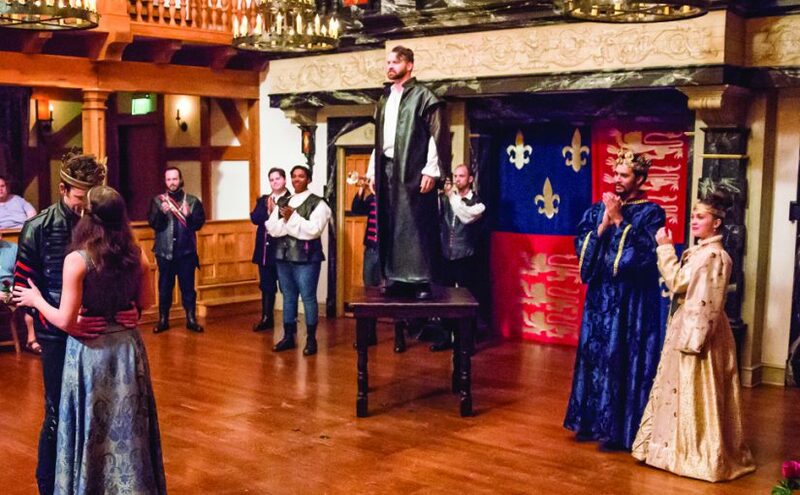 Develop a truer understanding of Shakespeare by attending one of the American Shakespeare Center’s Shakespeare Weekends. Brainchild of ASC’s new executive director, Ethan McSweeney, the weekends mark the opening and closing of the Winter Season and offer additional chances to learn about the Bard’s world. Plan to attend a weekend and take advantage of packed schedules of performances, lectures, workshops, and a benefit concert. The Winter Season: The Actors’ Renaissance has “become a hallmark of ASC’s unique blend of scholarship and practice.” In only 10 days or fewer, 12-15 ASC actors rehearse four plays without guidance by a director. The company takes full control of all creative decisions. This includes delivery, blocking, setting, music, props, and costumes. The actors then perform the four plays in rotation. The Actor’s Renaissance attempts to bring to life the conditions Shakespeare’s original players would have experienced. The intention is that scholars, players, and audience will make new discoveries about Shakespeare’s art and world. The 2019 Winter Season lineup includes Shakespeare classics Henry IV, Part 1 and The Merry Wives of Windsor. Also showing is Arden of Faversham, written by an unknown author. This play is an Elizabethan true-crime drama about ordinary people that is sure to captivate you. Finally, Amy E. Witting’s Anne Page Hates Fun, is a new, modern companion piece to The Merry Wives of Windsor, part of the Shakespeare’s New Contemporaries program. The program intends produce 38 new plays, inspired by Shakespeare, by playwrights of all backgrounds and perspectives. Experience opening night energy as the Actor’s Renaissance Season opens this weekend. Enjoy performances as well as special programming including a lecture by Dr. Ralph Cohen, and the announcement of the Summer Festival and Fall Season. The Winter Season closes on Renaissance Weekend. You’ll be able to see the final performances of all four productions and a staged reading of The Belle’s Stratagem. Other weekend events will include workshops, lectures, and the Band Candy Benefit Concert to raise money for ASC music. If you can’t attend a Shakespeare Weekend, don’t worry: ASC’s talented company performs all year with five seasons of plays in repertory, so you’ll still be able to get your Shakespeare fix. Click here for the calendar. Looking for a way to shake the post-holiday blahs? Let Staunton serve up a sure cure for you. Start planning a winter getaway for your family, your couple, or your friends today! With Staunton as your starting point, you’ll find a plethora of spectacular winter views. Go east for drives or hikes along the Blue Ridge on the Skyline Drive or the Blue Ridge Parkway. Venture west to explore the Alleghenies and Bath County. Stick close to Staunton for some of the best winter pastoral views. Close your eyes when you enter one of Staunton’s fine dining establishments and you’ll think you’re in a much larger city. Indulge your taste buds with fine dining at The Shack or Table 44, global fare at Chicano Boy Taco or Taste of India, traditional and delicious meals at The Depot Grille or the Mill Street Grill, or the retro dining experience at Wright’s Dairy Rite. If hunting for treasures is your game, you’ve got to check out Staunton’s vintage offerings. From funky finds to recycled riches, spend the day perusing Staunton’s eight antique shops and markets. A short drive to Verona will get you to the Factory Antique Mall, one of the largest in the country. Read all about our antique offerings. There are many reasons that Staunton keeps popping up on the best small towns lists and one of them is its beauty. From its rolling hills and quaint Victorian architecture, to parks, gardens like the one at the Anne Hathaway Cottage Tea Room, to industrial elements like the red neon Stonewall Jackson Hotel sign, the train station, and Sears Hill Footbridge over the tracks, you’ll find no end to cool backgrounds for your selfies. While you’re here seek out Staunton’s five photogenic hot spots. Staunton provides a healthy dose of history. As one of the oldest cities west of the Blue Ridge Mountains, Staunton’s history spans three centuries. A wide selection of historic attractions, archival collections, old buildings, museums, and Civil Warsites are located in and around Staunton. Highlights include the Frontier Culture Museum, an outdoor living history museum providing snapshots of life on the frontier from the 1600s through the mid-1800s in this area. Jumping ahead to the 20th century, take a closer look at our 28th president at the Woodrow Wilson Presidential Museum as you take a self-guided tour through seven galleries that explore Wilson’s life and legacy. Highlights include the President’s restored 1919 Pierce-Arrow limousine as well as a new, state-of–the-art World War I trench exhibit complete with lights and sound to experience what life was like for soldiers as they engaged in battle. You can also tour historic districts downtown and learn about Staunton’s place in Civil War history as you explore Thornrose Cemetery. under the stage. Photography— including selfies–are encouraged! Tours are (usually) available Monday-Friday at 2 pm and Saturday at 11 am. The Actors’ Renaissance Season kicks off on January 11. With no director, little costume assistance, and very little rehearsal time—similar to the way historians believe Shakespeare’s company operated—ASC actors take the stage in four different productions: The Merry Wives of Windsor, Henry IV, Part I, Anne Page Hates Fun, and Arden of Faversham. Other “winter friendly” attractions include: the Camera Heritage Museum, R.R. Smith Center for History and Art, and Sunspots Studios. Situated between Shenandoah National Park and the Washington and Jefferson National Forests, Staunton is a great place to view winter wildlife. See our list of wildlife hot spots for when the chilly weather keeps you close to your hotel. If you feel like venturing beyond Staunton, check out Winter Wildlife Hot Spots Part 2: Farther Afield. Two new, affordable hotels have opened for business this fall. They are the first developments in Staunton Crossing, an area that will soon include restaurants and retail space. The hotels are ideally located for enjoying all the area has to offer. Guest and visitors to both properties will enjoy proximity to restaurants and shopping, easy access to interstates 81 and 64 and with only a short drive, access to downtown Staunton. If you’re tired of the anonymous hotel experience, try Tru, Hilton’s newest hotel chain, which opened in Staunton in November. Tru focuses on building community. You’ll experience that when the friendly staff makes recommendations for taking advantage of the local culture and dining scene. A mural in the lobby features Staunton landmarks, and the 24/7 convenience kiosk stocks local products. Tru’s 90 efficiently designed rooms feature great mattresses, lots of towels, and large TVs. Tru’s community spaces really stand out, however, and guests should make sure they go down to the open-plan lobby to mix and mingle. Guests are encouraged to use the flexible spaces, decorated with invigorating colors and hip phrases, for working, playing, eating, and socializing. Guests can work at a counter or a semi-private, sound-insulated nooks, play board and table games, shift furniture into useful groupings, and interact with the real-time social media wall. Included in your stay is a complementary breakfast, which features bagels, plain donuts, yogurt, eggs, or oatmeal. Adorn each of these bases with your choice of over 30 toppings from the toppings bar. If you eat too much whipped cream, head to the fitness room to work off those calories! BOOK NOW. 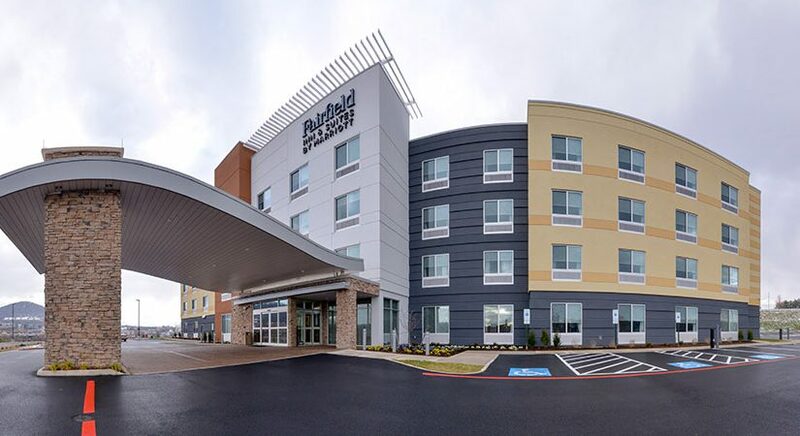 Visitors to Marriott’s 98-room Fairfield Inn and Suites will enjoy an “easy, positive and productive travel experience.” Travellers will know they’ve come to a good place when they enter the spacious lobby, which is bright with natural light. The hotel chain’s newly updated modern design aesthetic features plenty of flexible space for guests to lounge, work, and gather. Choose an individual space or pull up to the large farmhouse table to socialize while enjoying your complimentary hot breakfast. The breakfast features omelets, bacon, mini waffles, fruit yogurt, and pastries. If you want to work in the privacy of your room, you’ll enjoy the free Wi-Fi, plenty of outlets, an ergonomic chair, and a moveable desk, which affords endless options for creating your own workspace. Guests can choose rooms with king-sized beds, queens, or suites designed to provide separate working and sleeping zones. Tech-savvy guest should check out the app, which will let you make plans with your hotel and determine the readiness of your room. Are you hankering for a midnight snack that doesn’t come from a vending machine? The lobby’s Corner Market stocks goodies 24 hours a day. There is also a fitness center and an indoor swimming pool. BOOK NOW.